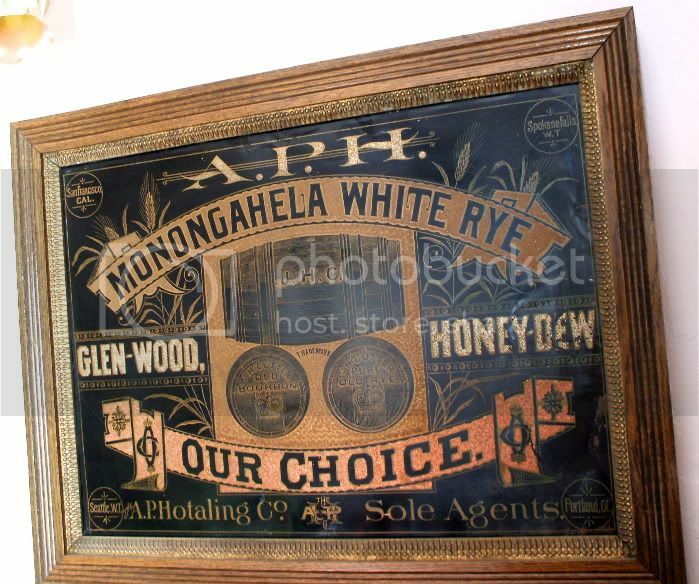 All of us that collect the older whiskies also appreciate the signs that were used by the dealers and agents to advertise their products. One of my favorites is the A. P. Hotaling Co, the largest wholesale liquor dealer in the West during the latter half of the 19th Century. Everyone is familiar with the many and varied bottles he produced to contain his goods, but not all are aware of his advertising. One of the earliest "Cutter" signs is this hand made piece from one of his Northwest agencies. It sits in the original frame and has painted on the back the address of the saloon it was sent to in Mt.Vernon, WT. It is printed on tin, and has the grain and vignettes done on gold lettering. The brands that he wanted to promote are lettered in gold with "gold" "sprinkles" added to the two at top and bottom, and "silver" on the side brands. J.H.Cutter, with the logo barrel ends is in the center. In the corners are the agencies that he had opened at the time. Clockwise from the top left are, San Francisco, Cal, Spokane Falls, W.T., Seattle W.T. and Portland, O.
WOW! Doesn't get much better than this for a "whiskey go-with". Great piece Mike. That's an awesome sign ! What bottles do you think he used for these products? The only "Our Choice" and "APH" bottles that I have are plain, unembossed fifths and flasks, but with the appropriate paper labels. I also have a nice backbar that advertises the "Old Grand Dad" brand, and a paper labeled fifth that wears the "Old Crow" label. There are others that demonstrate the Hotaling Co's interest in other wines and liquors, especially after Anson senior's death and the subsequent divestment of the J. H. Cutter brand to Sherwood and Sherwood.